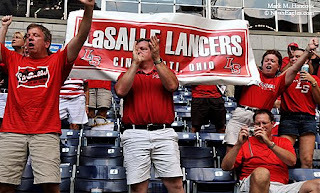 Cincinnati LaSalle Catholic fans cheer as the team takes the field before a game against Cedar Hill during the Kirk Herbstreit Varsity Football Series at Texas Stadium in Irving on Saturday, Aug. 30, 2008. 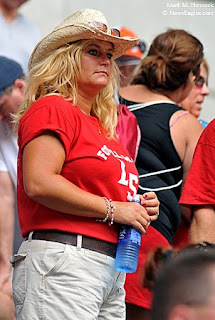 Cincinnati LaSalle Catholic fan Linda Shad waits for the team to take the field before a game against Cedar Hill during the Kirk Herbstreit Varsity Football Series. Cedar Hill's Lawrence Wooten (No. 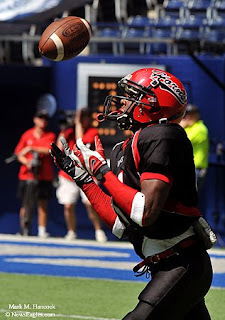 81) tries to find a handle on the ball during a game against Cincinnati LaSalle Catholic at Texas Stadium. 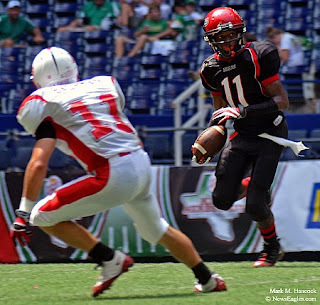 Cedar Hill's Keenan Walker (No. 2, left) plows into the Cincinnati LaSalle Catholic defensive line. 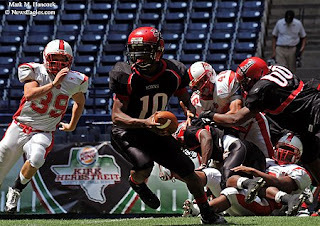 Cedar Hill's Driphus Jackson (No. 10, center) looks to lateral the ball as Cincinnati LaSalle Catholic's Andrew Neilheisel (No. 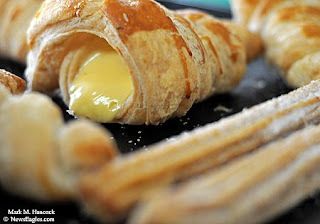 39, left) pursues. 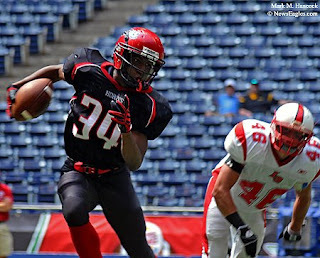 Cedar Hill's Ben Malena (No. 1, right) gets tackled by Cincinnati LaSalle Catholic's Ben Ingle (No. 19, left). 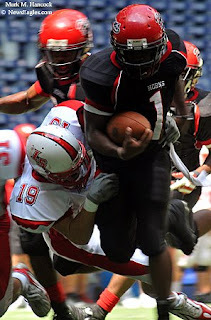 Cedar Hill's Jonathon Knight (No. 38, right) tries to tackle Cincinnati LaSalle Catholic's Rickey Steele (No. 3, left). Cincinnati LaSalle Catholic's Zach Abbatiello (No. 24, left) as Jesse Back (No. 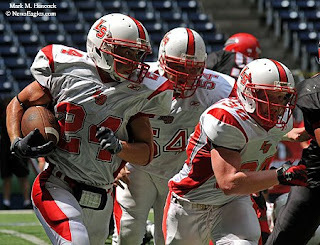 54, center) and Matt Farrell (No. 30, right) block. Cedar Hill's Laquan Harper (No. 11, right) tries to find a hole as Cincinnati LaSalle Catholic's Patrick Bachman (No. 11, left) changes direction. 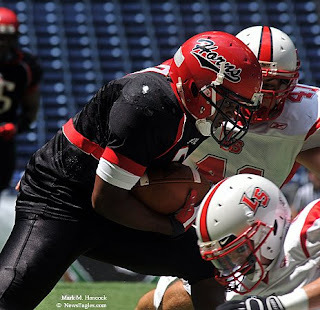 Cedar Hill's Brandon Davis (No. 34, left) looks for an opening as Cincinnati LaSalle Catholic's Adam Licht (No. 46, right) pursues during the Kirk Herbstreit Varsity Football Series at Texas Stadium in Irving. 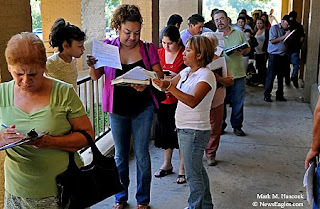 Legal residents begin paperwork during a citizenship workshop at the Northside Community Center in Fort Worth on Saturday, Aug. 23, 2008. 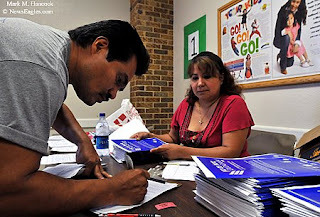 Angel Hernandez of Haltom City (left) signs in at Laticia Lopez Morales' station during a citizenship workshop. 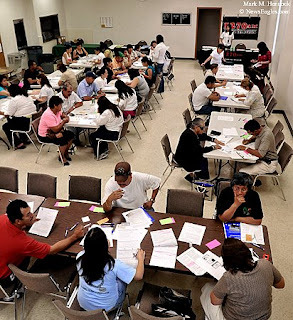 Legal residents work with volunteers during a citizenship workshop at the Northside Community Center. 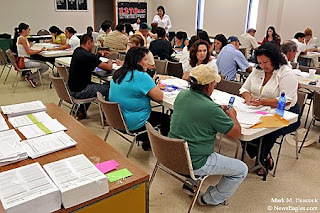 Legal residents work with volunteers during a citizenship workshop. Guests attended classes and got personal assistance to complete applications and help them prepare for naturalization. 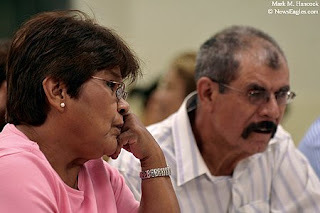 Juanita (left to right) and Urbano Rodriguez of Fort Worth answer questions during a citizenship workshop. 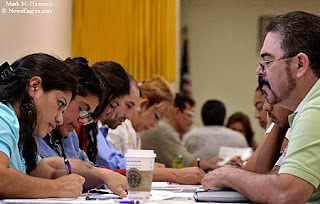 Douglas Inteviano, executive director of Proyecto Inmigrante, (left) and volunteer Erika Martinez (right) work with legal residents during a citizenship workshop. 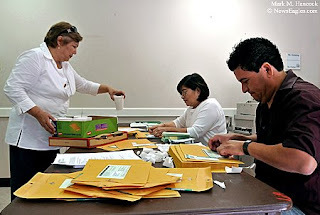 Volunteer Adriana Cadena (left) works with Guadalupe Flores of Dallas (right) during a citizenship workshop. Raul Jarillo (left) helps Leonardo Torres (of Fort Worth with a computer program during a citizenship workshop at the Northside Community Center. 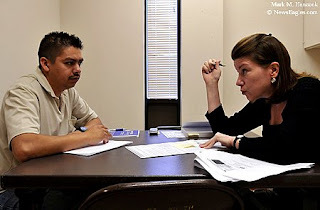 David Cecenas of Fort Worth (left) completes the process with immigration attorney Alice Margaret Gruber (right) during a citizenship workshop at the Northside Community Center. 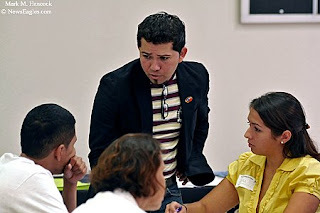 Maria Herrera, co-founder of Casa de Imigrante, (left to right) brings coffee to volunteers Francisca Dominguez and Alberto Juarez during a citizenship workshop at the Northside Community Center in Fort Worth. Guests attended classes and got personal assistance to complete applications and help them prepare for naturalization. Dr. James Peake, U.S. Secretary of Veterans Affairs, tours the Fisher House under construction at the Dallas VA Medical Center in Dallas on Monday, Aug. 25, 2008. 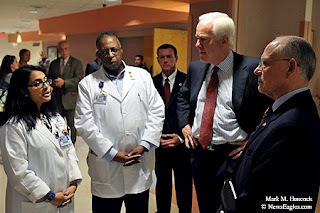 Dr. Itala Wickremasinghe (left to right), registered nurse Tony L. Murphy, U.S. Sen. John Cornyn and Dr. James Peake talk during a tour of the Dallas VA Medical Center. 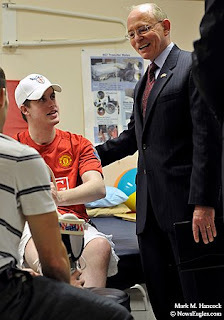 Dr. James Peake (right) talks with cavalry soldier Daniel Connelly of Fort Worth (left) during a tour of the Spinal Cord Injury Center of the Dallas VA Medical Center. 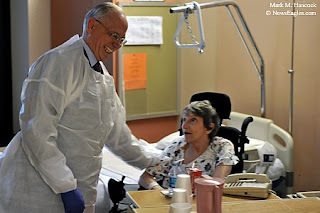 The officials toured different parts of the medical center including a psychiatric facility, which was closed following several patient suicides. Dr. James Peake (left) has a chuckle with patient Jonni Booth Carnley of Hugo, Okla. (right) during a tour of the Dallas VA Medical Center. 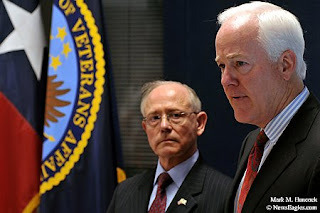 Dr. James Peake, U.S. Secretary of Veterans Affairs, (left) and U.S. Sen. John Cornyn (right) talk to media after a tour of the Dallas VA Medical Center in Dallas. Dallas VA Medical Center praised for swift upgrades after suicides by Scott Farwell. Here's a program to help fix the overall economy and get us back on track. The system sounds complicated, but we already understand the principles. It merely needs to be defined into concepts we already understand. Each month, we all get "paid." If you're like most Americans, you actually receive computer credits through electronic funds transfer (EFT). It equates to actual cash. However, it appears in your bank rather than in your pocket as greenbacks. These electronic funds are guaranteed by the government. We pay all our bills, go to the movies, get our coffee and perform every other function of our lives without ever touching an actual piece of cash. At the end of the month, we've probably carried only 20 bucks in actual cash. The rest of our income and expenses were handled electronically through debit cards or checks. Everyone got their proper amount of electronic money while we earned our electronic money for the following month. This is everyday life unless you're a strange person, who insists be being paid in gold. I've heard the dire warnings issued by proven liars and people who put us all into this mess in the first place. Consequently, I'm not inclined to believe them. When I hear there is only ONE way to fix this and it involves NO oversight, I put on the brakes. This is more "Shock Doctrine" being pushed by an exiting lame-duck president to make the greedy richer. I was talking with my brother earlier this summer. The conversation turned to tax write-offs. He said he liked the option of tax write-offs, but wished they were immediate. So does everyone in business. I've considered how this could be possible (everything is possible if there's enough will behind it). I imagine this is something any respectable politician could grab and turn to everyone's benefit. The basic concept is simple. Implementing it is slightly more difficult. However, if we look at both the short-term and long-term benefits, it's logical and fair. The goal is to allow businesses to benefit from an immediate tax write-off upon purchase. A legitimate, tax-paying, U.S. business would essentially get to purchase business-related products and services interest-free against potential profit. It's a legal system of barter and credit all rolled into one. The businesses benefit, the employees benefit and the government benefits. The immediate benefit is an actual business and industry shopping spree and redevelopment. It also makes "Made in America" the single most valuable tag on any product without being protectionists. With any governmental program designed to move a country's economy, there's must be some bureaucracy, but it won't cost $700 billion. Additionally, some companies won't be able to directly benefit from this program for various reasons. From a business-owner's point of view, it forces businesses to make a profit (not an entirely bad thing). Some will say this is spending tax dollars. However, it's tax dollars that wouldn't be paid anyway (they're legitimate write offs). It only means the money must be repaid instead of written off. When you consider the Wall Street bailout, this is a more logical alternative because this plan involves real jobs, businesses, money and products. There's none of the fictitious stuff and no way for corrupt executive abuse of the system. The big carrot in this plan is every U.S. business can immediately purchase U.S., business-related products and services at no out-of-pocket cost. The secondary carrot is the uncorking of business-to-business (B2B) activity. Only tax-filing U.S. businesses can participate. Furthermore, those with a proven profit capability or significant prior year write-offs will be the first beneficiaries. If a company doesn't file U.S. taxes annually or "cooks the books," the company is only hurting itself. The biggest, baddest stick is the IRS is actually holding the note. The IRS has the absolute power to eliminate businesses and garnish wages. They can impose painful penalties and interest is compounded daily if payments aren't made when due. This alone makes this profitable for taxpayers. Currently, a business must have capital available to pay for a hypothetical widget. This expense is removed from the company's operating budget. The company uses the widget to earn cost plus profit (as a raw material or resale). The cost of the widget (as well as various other business expenses) is written off against the gross profit (income). Additionally, all other business expenses are written off against gross profit to establish net profit. Taxes are then paid on the remaining net profit. A business gets credits for the last business cycle's raw material expenses, amortized items and profit. This is the working expense budget for products and services (supplies). Instead of paying cash, the company would fill out a one-page form (a purchase order) or use something similar to a governmental credit card to buy goods and services and file it electronically through the IRS for the vendor. Instead of the check coming from the company, the government would verify the payer has tax credit funds available and electronically transfer these funds to the vendor for the supplies. These funds would be applied against the tax account of the business that filed the purchase order. No actual cash changed hands. The business that needed supplies got the supplies with tax credits, but has the burden of filing the proper purchase order. The company with the supplies electronically receives credits from the government and releases the products and/or services. The seller now has credits to buy from elsewhere. So far, the government hasn't actually paid anything outside a bank and both companies benefit. This is the point where the IRS issues an interest-free digital draft (loan) to the bank to cover the funds. If this company needs cash (to pay employees, rent or other non-covered issues), they can withdraw the money electronically or as cash. The company filing the PO then covers costs and makes a profit from the supplies. From this profit, they should set aside the cost of the PO to reimburse the government for the loan (because the PO purchase isn't a tax write off). Then, they must pay other operating expenses. The remaining profit belongs to the company and/or shareholders. Now, both companies have benefited, the government will be reimbursed with the next tax cycle and the company made a profit. Additionally, at least one employee kept a job at each of the companies. This creates two employees paying state and/or national income taxes rather than drawing from unemployment. There's also a fraction of a job at the IRS and banks for this transaction. While the government may not control the capital, the short-term loan should more than pay for itself in jobs saved (income taxes paid) and gross domestic product increases. Any business (including sole proprietors) that filed a U.S. tax form last year is eligible to participate in this program. The U.S. government must set aside start-up funds for the program (these will be reimbursed when the companies file taxes). These businesses could use last year's expenses and profit voucher credits to purchase raw materials, office supplies, new equipment and services (including advertising). It's essentially a short-term, interest-free loan from the government against the next tax return. This allows the company to immediately purchase goods and services based on prior performance rather than the liquidity of for-profit loaning institutions. It doesn't mean it's a handout since the true amount of the purchase is paid by the government via the voucher system and this must be accounted on each business' taxes. It does mean, however, a business must earn an amount equal to or greater than the funds spent during the same time. While this may sound like a stretch, it means the company can supply products and services to other businesses at full price and accept the voucher PO payments. So, it should balance out. The only potential problems would be encountered if a business pays its executives/employees too much, pays too much rent or prices its goods and services too low to break even. Since only U.S. tax-paying businesses can participate, businesses operating in foreign countries and "under the radar" can't. This would include businesses that don't pay taxes, aren't legal businesses as well as those that owe back taxes. To keep bureaucracy to a minimum, most of this must be accomplished through the IRS and its database. It already has all the information needed and the means to electronically transfer funds. So, new personnel must be hired by the IRS to manage this program. Hopefully it'll only require a single office of a few computer gurus. This office's sole purpose is to process online payment vouchers and electronically transfer funds to the companies. The initial allowance is equal to the previous year's purchase expenses plus profit. This doesn't include expenses such as salaries and property rental, but could include most raw materials as well as amortized business-related machinery and services from other businesses. Once a business hits the limit, it must go back to cash, check or credit (as it is now). While the very large offshore corporations won't be motivated to onshore their businesses and pay proper taxes, some medium-sized companies will. Particularly since business partners will immediately recognize they're dealing with an offshore company when they're unable to pay or receive U.S. vouchers. The result of this program would be to drive U.S.-made products and services. On a grand scale, refineries could get U.S. crude oil for a purchase order against income. On a smaller scale, restaurants can hire pro photographers and advertise in the local paper against income generated by the ad. We'll return to a profit-based economy rather than a speculation-based fictional economy. A profitable company is profitable. The share prices really have little to do with actual profit - those are loans from shareholders. Those loans are repaid through dividends and share price maintenance. It kills me to see profitable companies cutting jobs to drive up stock prices. The shareholders should either get a dividend or not. I could care less about a CEO's stock options. This practice never should have started and needs to stop now. If there's no motivation to falsely inflate or devalue shares, businesses (and jobs) return to supply and demand and plain old profits everyone can understand. If you feel this is a better option than the current administration has submitted, act now and send a copy of this post to your elected officials before it's too late. The bailout will probably go through either way. However, this plan can be implemented after the bailout to help us quickly recover from this mess. The House Republicans are trying to shift the blame for this mess away from themselves. The formerly Republican-controlled House, Senate and President were instrumental in removing systematic safeguards and fundamentally caused the current economic crisis. Now, the House Republicans have presented a program to secure the funds of those who have profited most from the market's meltdown. They're trying to inject a "capital gains tax break" and less regulation into the bailout. When the country is about to spend $700 billion to salvage a banking industry and another $10 billion per month on war efforts, it isn't the time for a tax break and less regulation. Some speculate it would have the opposite effect. Furthermore, this isn't a tax break for common Americans. Instead, it's for the people who made money through the short-selling practices that destabilized the system and helped bring it to its current condition. These people should pay more taxes for their actions. Politically, the plan is so repulsive they hope the House Democrats as well as both parties in the Senate will pass the previous plan (they have the votes) and make the House Republicans look good to their rich friends down the road. Then, the House Republicans can blame the House Democrats for the bailout because they won't vote for it. However, this means these House Republicans are essentially in favor of the total collapse of the economic system. They would rather watch the world's economies die than take responsibility for their actions. I don't want to believe anyone could be this corrupt. I don't want to believe they would give tax breaks to the people who threw gas on this fire. So they must think we're too stupid to see what they're doing politically. The House of Representatives defeated the bailout plan. This is unexpected. However, it opens the door to reintroduce the program detailed below. This program essentially bypasses the bankers and Wall Street. It provides cash flow to the businesses and workers. It's a guaranteed way to get businesses moving again without rewarding the people who caused this problem. Please re-read the program offered above and contact your elected officials. It's time again to take five minutes and fill out an e-mail petition to your senators and representative. Simply enter your name and address and the program will generate and send the e-mails to the correct legislators. The NPPA and various other creative arts groups request the participation of everyone who has ever earned any income via copyright (or plans to do so). Senate bill 2913 and House of Representatives bill 5889 are being introduced for a vote this session. This means your attention and letters are needed now since Congress didn't listen in April. We previously discussed this so-called "Orphan Works" legislation on 16 March 2006 and again on 21 Nov. 2006. Furthermore, plan on jumping through these same hoops for the remainder of your career. While some people want us to believe a kindly, grey-haired librarian wants to show children prints from the 1920s, don't believe them. Librarians don't have the money needed. This legislation is being pushed by people with deep pockets to buy lots of lobbyists and push this through during each session. I'm certain Leahy didn't want his name to appear on this Senate bill. Consequently, he named the bill after the late Shawn Bentley, a lobbyist and Time Warner vice president of intellectual property and global public policy. When did Time Warner start caring about librarians' ability to use photos commercially? In short, it's reasonable to believe telecom giants are trying to get control of the images they're holding on their servers and moving through their routers. Furthermore, they would love to use them payment-free for advertising purposes and let you get sued. Additionally, this latest legislation shifts the burden of proof of income from the infringer to the photographer. You don't need to look deep to find the reason this will be a recurring nightmare for visual artists and PJs worldwide. Simply look at the sponsors of the bills (and memorize them for election day). I'm certain these fine gentlemen of Congress have interesting cooperation on other Washington matters. Please feel free to put your journalistic skills to the test and ferret out which dots might connect. The second name on this list tells me much. Search for "Orrin Hatch lobbyist," and you'll learn his son, Scott D. Hatch, is a successful lobbyist for Walker, Martin & Hatch according to SourceWatch (the Center for Media and Democracy). The younger Hatch lobbies for telecom companies. Also according to SourceWatch, "Jack Martin was 'a veteran' of Senator Orrin Hatch's senate staff..." and Walker retired from Qwest Communications International Inc. I'm certain the Hatch family might say this is coincidence. It's also a coincidence when SourceWatch reports, "in 2002, the firm reported a lobbying income of $930,000, with most of the fees 'paid by companies and groups that count on' Senator Hatch for support." This is why I'm saying it'll be an ongoing war until there's no money left to buy votes. So my gentle PJs, get accustomed to combating these so-called "Orphan Works" bills each spring and fall. They're going to be around for the remainder of your career unless you decide to stop petitioning. We can't waiver or become apathetic and let our images be stolen for commercial use without a fight. Thank you for contacting me regarding copyright protection. I welcome your thoughts and comments on this issue. Copyright protection has been central to America's prosperity and job creation. Movies, books, computer software, television, photography and music are among our unique American products and some of our most successful exports. United States industries depending on copyright protection employ nearly 4 million workers and produce over $65 billion of our exports - more than agriculture and automobile manufacturing. Protecting content in a high-technology age is a new and daunting problem, and copyright protection is an important challenge as the broadband revolution offers even more far-reaching possibilities and opportunities. With new speed and interactivity, the entire store of movies, music, books, television and raw knowledge can be made widely available. I believe copyright protection is a foundation of innovation, and copyright law should work to ultimately protect the best interests of consumers. Intellectual property is the creative core of the information age. I will keep your views in mind should the Senate consider legislation addressing this issue. While it sounds good, the line, "...and copyright law should work to ultimately protect the best interests of consumers," concerns me. This could be read either way. I'm optimistic and read it to mean consumers have more options because we keep our copyright. Telecom companies may read it to mean they get my copyright to provide my images for free to their customers. If my work is stolen, I couldn't afford to create new work. If Congress allows this theft to happen, professional images of our combined human experience will effectively end on the day the bill gets signed. "Sep 26, 2008: This bill passed in the Senate by Unanimous Consent. A record of each representative's position was not kept." So much for optimism (and hopefully incumbancy). 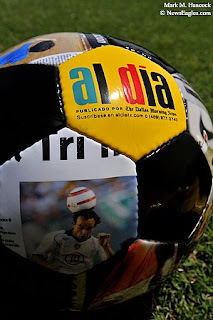 Promotional Al Dia soccer balls are displayed during the Copa Al Dia soccer tournament at the Bob Wiseman Sports Complex in Lewisville on Saturday, Aug. 9, 2008. FC Duncanville's Joseph Salinas (No. 12, left) and Cesar Gorsia (No. 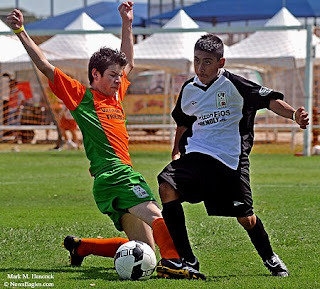 14, right) of Arlington's UCS Rangers battle for the ball during the Copa Al Dia soccer tournament. FC Duncanville's Caleb Mancia (left) tries to stop Romario Vargas (No. 12, right) of Arlington's UCS Rangers during the tournament. FC Duncanville's Alexander Jimenez (No. 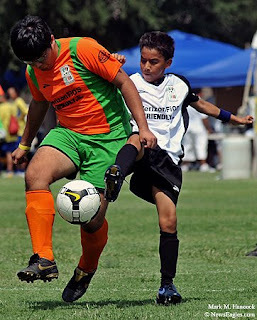 5, left) passes the ball away from UCS Rangers' Kevin Zubia (No. 10, right) during the tournament. 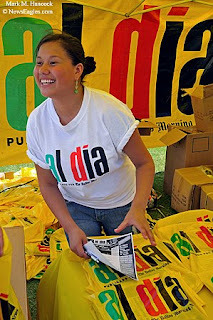 Diana Martinez with the Al Dia promotions department laughs with customers during the Copa Al Dia soccer tournament. 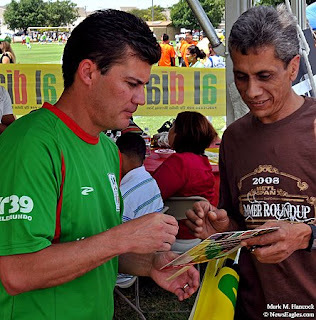 Mexican soccer star Ramon Ramirez (left) signs an autograph for Luis Romo of Farmers Branch during the tournament. 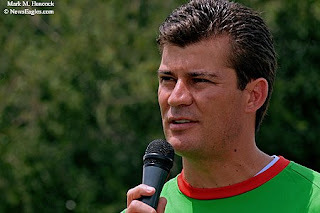 Mexican soccer star Ramon Ramirez talks during the opening ceremony of the Copa Al Dia soccer tournament. 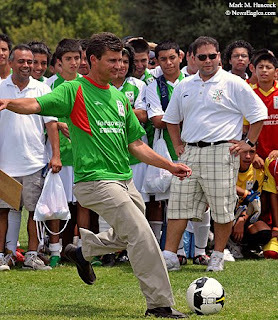 Mexican soccer star Ramon Ramirez (left) makes some practice shots on goal against tournament goal tenders during the tournament. 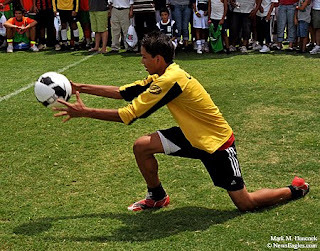 Josh Guerra, 14, of The Colony successfully stops a shot on goal by Mexican soccer star Ramon Ramirez during the Copa Al Dia soccer tournament at the Bob Wiseman Sports Complex in Lewisville. Anyone needing help or wanting to report major news to media professionals can direct tweets to @emergencynews and those replies appear on the Emergency News Twitter search. The system doesn't require senders to follow @emergencynews when they submit as a reply. However, it does require the follow for direct messages. This search is linked on the sidebar of this blog as well. This is an organic breaking news system for Tweets. Let's say you need to find a missing relative as news breaks. @emergencynews Has anyone seen John Doe in New Orleans? He lived in the blue house at 123 Main Street. @emergencynews John Doe on Main Street in New Orleans is fine, he's evacuating today (with details). Media members can use the @emergencynews Twitter feed as an emergency back-up system or to find news stories with possible sources. For instance, they could contact the person making the inquiry above to get an interview or pinpoint other news. @emergencynews Exactly where did the tornado touch down in Little Town, Kansas? @emergencynews It touched down on Main Street near 4th Ave. in Little Town KS. To make this system work, I request media members with Twitter accounts to follow the emergencynews search feed. Click "Follow" under the photo on the @emergencynews link. As news happens, you're welcome to direct questions to the feed (via reply "@emergencynews") or help others by providing information. 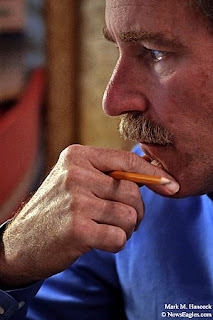 Jim Hill, USA business development manager for Scientific Publishing Service of India, works at his home office in McKinney on Monday, Aug. 11, 2008. Hill, a former Plano-based publisher, was downsized and has reinvented himself into an international marketing leader for the Indian company. He is capitalizing on the current global economy. 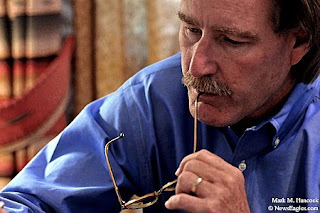 Jim Hill gets frustrated during an Internet phone conversation with a colleague at his home office. Jim Hill files paperwork at his home office. 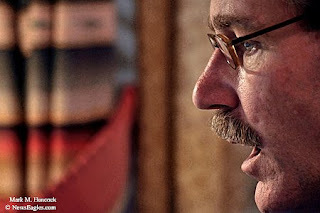 Hill makes sales calls to publishers around the world to convince them to outsource to his client in India. 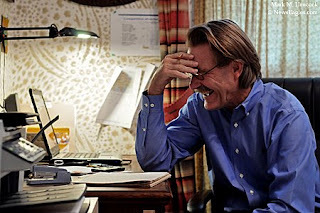 Jim Hill laughs during an Internet phone conversation. 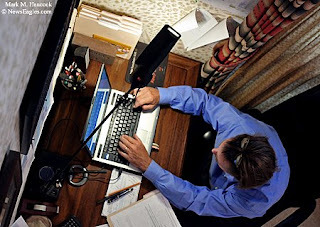 Hill appreciates the freedom, flexibility and increased income of working from home. 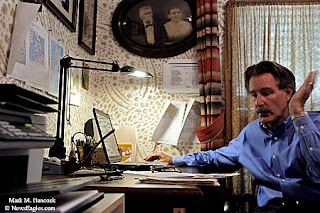 Jim Hill works at his home office in McKinney. He said his income increased 50 percent since he was laid off. Please read, "Downsizings force baby boomers to reinvent careers" by Bob Moos. Frisco Centennial quarterback Ryan Mossakowski poses for a portrait at the school in Frisco on Monday, July 21, 2008. 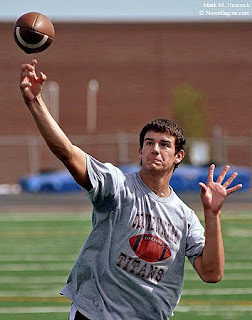 Frisco Centennial quarterback Ryan Mossakowski throws the ball to a teammate during an informal practice at the school. Mossakowski is one of the area's top recruits as he heads into his senior season. 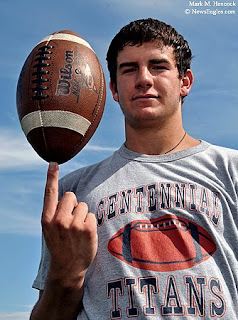 Frisco centennial quarterback Ryan Mossakowski poses for a portrait at the school in Frisco. If you're wondering why I've focused on Twitter lately, read "Newspapers that Twitter" at graphicdesignr. Twitter is a short-comment social network (micro-blogging). It's most similar to the BBS boards in the 80s. However, each "Tweet" is limited to 140 characters and can accept input via the Web or mobile devices (phones). To conform to the size limitation, it automatically converts feeds into Tiny URLs. Speed is the key to Twitter's success. Unlike a regular blog, links are created automatically by hitting the "follow" button under a Twitter's icon. The icon is automatically added to the sidebar and the RSS feed flows into the stream. Likewise, "followers" (backlinks) are automatically generated on a sidebar link. It's quick and easy to follow, stop following or know who's following any feed. Feedback limitations to what's important is its main advantage. Reader-generated diatribes tend to be more than 140 characters and aren't needed during emergencies. Graphicdesignr points out some interesting stats. Papers only using TwitterFeed aren't doing great. Those with a combination of feed and live (Web) updates are doing very well. While CNN is killin' it, the highest achievers use it as one-time, organic news capsules. They can give and get emergency information quickly about a specific event. This is particularly important during power outages, but requires functional cell towers. Here's how the Chicago Tribune used it during Hurricane Gustav: @gustavreporter. I've grabbed @emergencynews. I found a work-around by using search.twitter.com. Anyone with news or information about public emergencies could post replies (start tweet with "@emergencynews") for media outlets to follow. This makes it function for organic news and emergency information. Each commenter controls their own tweets without someone else deleting them. I'll save y'all some time because @breakingnews and @newsalert(s) are already taken as well. 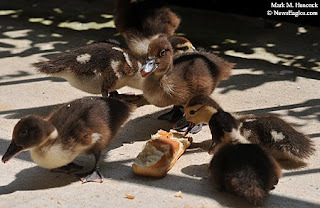 My main Twitter feed (all the boring daily stuff I do) is @newseagles for those who might want to follow the duckling feeding schedule, my publications/assignments and blog posts. The Twitter search engine doesn't currently search profiles for some inexplicable reason, so it's difficult to find. It's also linked on the sidebar. If you want to learn more about social networks and ambient awareness, please read "Brave New World of Digital Intimacy" by Clive Thompson of The New York Times magazine. This is a test of the emergency Tweet system. Had this been an actual Tweet, I'd be a canary. I'm trying to have Twitter accept both this blog and Facebook feed. 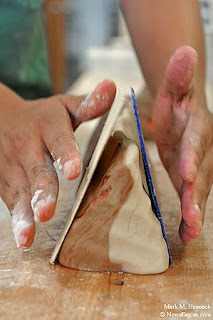 I've got the blog figured out through twitterfeed.com (Open ID required). I'm still working on the Facebook feed. I've got the feed from here to there, but Facebook doesn't appear to allow RSS externally. Twitter feeds to Facebook easily, but the volume would be too annoying. 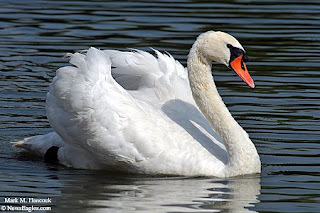 Juliette the swan swims on a private lake in Plano on Tuesday, Aug. 26, 2008. 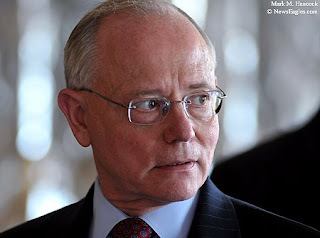 David Leeson and 269 other DMN staffers took buyouts. Another 80 jobs are expected to be cut in October. The News Buyout blog is voluntarily listing any former staffers affected by the latest actions. According to Pegasus News, the situation gets worse. After the Fort Worth Star-Telegram had three layoffs this year, it and DMN have entered a distribution alliance. Even though the DMN buyouts were expected for months, I'm speechless. Cub Reporters helps novices break into journalism. It's particularly useful for beginning journalists because it presents advice and resources for students to gain internships and basic knowledge about the industry. New photojournalism students need to understand photography is about nouns while photojournalism is verbs. At the highest level, photo stories have the same construction as news stories. There is a lead image, transitions, emotion and resolution. Throughout the story, characters, conflicts and motives are revealed, explained and concluded. Still images remain the most powerful communication tool. Each still image can literally burn into the brain of a viewer. Images speak to every person in their own language. This power accompanies massive responsibility. Consequently, photojournalism is more than a vocation. It becomes a way of life. Right now is a challenging time for the industry. Due to image superfluity and reduction of outlets, it's difficult for photojournalists to make a living. I won't discourage anyone from trying, but everyone entering the field must understand they must be better than established pros at everything. They need superior technical skills, a business plan, access, outlets and a unique style. They must capture stories the world has never seen, or be able to tell old stories better than anyone ever has. Although the industry is in crisis, there has never been a greater need for ethical photojournalists. They must pursue difficult stories. Much of the news industry has been reduced to pop culture and delivery speed. Instead of following celebrity and entertainment, focus on the issues affecting everyone. Look for the emotion of the events unfolding in the world around us. People are hurting across the planet. Find the cause of the pain, and show the results to others. Whenever possible, show readers a way to help others. The baton is being passed to a new generation of photojournalists. The future of the current "press" industry is uncertain, but something new must take its place to ensure our combined survival. Watch for innovations and embrace new technology. Be timely, but also seek the timeless. Have a crisis "Go bag"
PJs living within 500 miles of the Gulf or Atlantic coasts are most likely to cover hurricanes. It's best to read through this information now, and be ready when someone calls. The remainder of this post is a checklist of items PJs need before they head into a hurricane zone (or many other crisis zones). Many items are redundant to the items mentioned in the posts above, but this post can act as the final checklist before PJs run off to die into danger. Prepare for hurricanes like a long camping trip, but make sure shots and life insurance policies are up to date. "Go" bags are called by various names, but they serve one purpose. With little notice, PJs can be out the door and headed into a news scene for a few days. It's best to duplicate many common-use items (like toothpaste) and leave them permanently in the go bag. It might be wise to print this list and keep it in the go bag. Otherwise, it'll be an expensive or dangerous trip for an ill-prepared PJ. Have three bags. They include a folding, reinforced, rolling suitcase; a Ranger ruck sack (it's larger than a standard ruck); and a waterproof bag. The suitcase is the standard option. It works for most travel assignments through airports or to a state championship game. It's most useful when PJs have a place to stay (hotel or friend's floor in safe location). The Ranger ruck is best for emergency use. These work for breaking news events because PJs don't know when or where they're going to sleep next. It allows PJs to keep everything in one place and move rapidly with little warning. Make sure to buy the frame, shoulder straps and padded waist strap. The waterproof bag is somewhat misnamed. At least it's water resistant. It should permanently hold a sleeping bag, a small pillow, a clean sheet, two pairs of dry socks, underwear, swim trunks and a dry T-shirt. Keep the items in the bag and don't remove them (other than during use and to clean them upon return). The bag (suitcase or ruck) contains items used once per day. If there are external pockets on the bag, they can hold larger emergency items. However, the bag should contain the first/last items of the day and should be kept in a dry, secure location if possible. This bag should contain clothes, spare towels, extra shoes and super emergency items (see below). Always pack one extra day's worth of clothes. The spare shoes should be sneakers or flip-flops and fold flat. Super-emergency items can remain in the bag permanently. Replace any used super-emergency items immediately upon return or sooner in case they're needed again. The rest of the items can be added when an assignment is accepted. These items can be acquired over time like other camera equipment. Muscovy ducklings eat hot dog buns on our porch in Plano on Friday, Aug. 29, 2008. The ducklings and their mother waddle onto the porch twice daily for snacks. If nobody is around when they arrive, they chirp at the glass door until they're fed. I know ducks are too easy, but these little critters are cute and demanding. I also plan to post some visiting geese and return to the Swan Story soon. I've shot a lot lately, but it's all on embargo. On the heels of Denver's lack of police control, St. Paul's cops more closely resemble a foreign country while they protect the Republican National Convention delegates from words chanted by protesters. Those Constitutionally-protected words can hurt. The RNC delegates might be delicate. However, those words don't hurt working journalists nearly as bad as being gassed, pepper-sprayed or slammed face-first into a wall by a cop. According to an Associated Press report, Matt Rourke, an AP photojournalist and close friend of mine, was arrested along with Democracy Now! anchor Amy Goodman (see the video of her arrest) and her colleagues Sharif Abdel Kouddous and Nicole Salazar while covering an anti-war protest march on Monday, Sept 1, 2008. All were later released and the county doesn't plan to file charges against Rourke or Goodman. Kouddous and Salazar were both injured and face felony charges of suspicion of rioting. Exercising active prior restraint on working journalists and violating Constitutional rights is a tactic best left in other countries. This is the United States. Journalists have degrees and Secret Service clearances. We cover the protests to show those without a voice as well as the peace maintained by the police. If the police officers are cool, it's documented. When the cops abuse power, it's also documented. The only reason for this behavior is an attempt to create a chilling effect of protest coverage. The cops are saying to all media, "Cover the protests, and you're in jail." I know for a fact that Matt is a squeaky-clean guy. He's a quiet, clean-cut dude. He works hard and has suffered through many hardships to bring the news to everyone. He freelanced at DMN when I was a staffer. 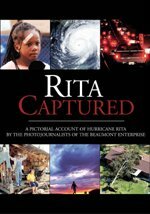 He moved to The Austin-American Statesman and won national awards for his Hurricane Katrina coverage and finally was hired by AP in Philly. He's a good guy with a great eye. I know he wouldn't have done anything that would get him arrested in any other city in America. St. Paul Mayor Chris Coleman said Saturday that free-speech rights are separate from criminal behavior. "We have worked very, very hard to make sure we've protected people's right to exercise free speech," he said. "To pick up a protest sign, that's fine. If you're here to pick up a brick or some other instrument, there's a problem." Apparently, "other instruments" include cameras, notepads or microphones. Mauricio Puente measures flour at La Poblanita Panaderia Mexicana in Plano on Tuesday, July 29, 2008. Bakery owner Danny Graves said the cost of flour has gone from $9.50 per bag to a high of $27 per bag. 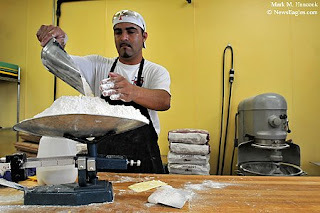 Aaron Meza prepares dough at La Poblanita Panaderia Mexicana. To keep customers, Graves absorbed the cost increases. 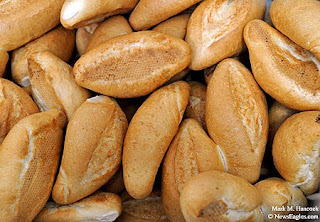 Fresh bread awaits customers at La Poblanita Panaderia Mexicana y Cafe in Dallas. 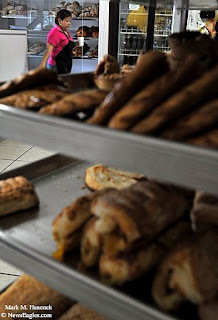 Different bakery goods await customers at La Poblanita Panaderia Mexicana y Cafe. 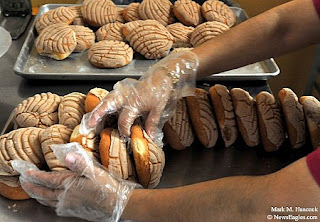 Maria Garduno prepares bakery goods at La Poblanita Panaderia Mexicana y Cafe. 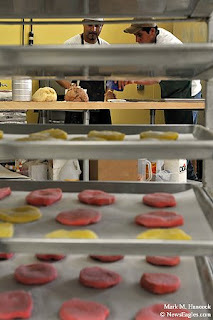 Mauricio Puente (left) and Aaron Meza (right) prepare cookie dough at La Poblanita Panaderia Mexicana in Plano. Maria Garduno prepares coffee for customers at La Poblanita Panaderia Mexicana y Cafe in Dallas. 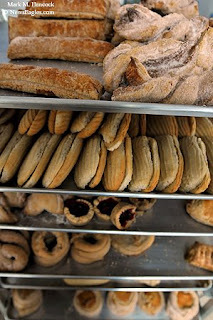 Sweet treats await customers at La Poblanita Panaderia Mexicana y Cafe in Dallas.